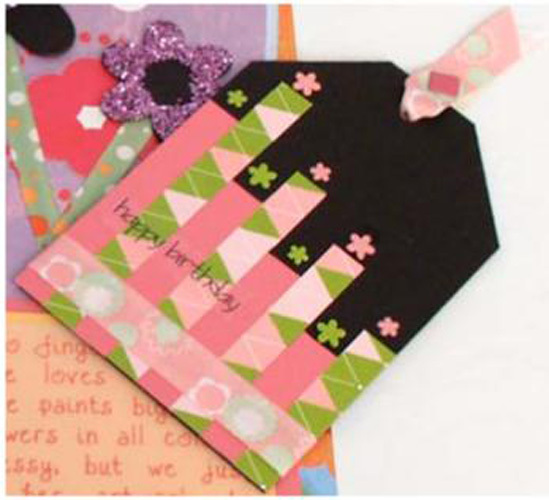 Project Description: Create your own Birthday Gift tags with Grafix products. Cut a large tag shape out of a piece of Black Chipboard. Your tag should measure 4”x 6”. Cut strips of patterned paper that are .5” wide and in varying lengths. Arrange the strips in descending lengths alternating the patterns and secure to the tag with strips of Double Tack. Place a brad at the top of each strip; you can use a large needle to poke a hole in the chipboard. Create text on your computer and print on to the Rub-Onz material, apply according to the directions on the package. Trim the bottom of the tag with a length of ribbon and adhere to the tag with Double Tack. Punch a hole in the top of the tag and thread a piece of ribbon through. Place a brad in the center of the ribbon.